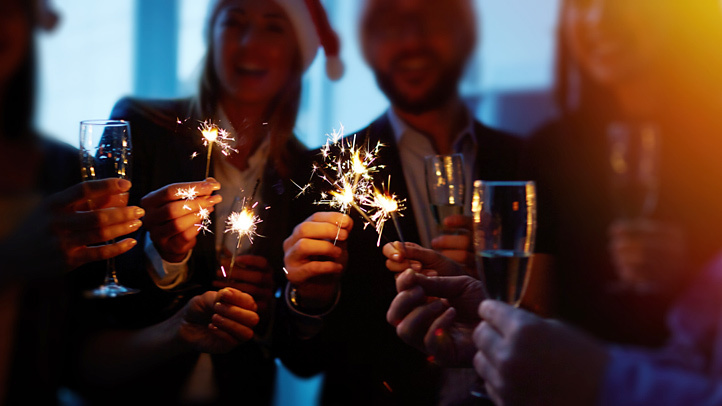 Holiday traditions are supposed to make you feel all warm and cozy and happy inside, but sometimes they can take an ugly turn — something emergency room physicians know all too well. CBS News talked with ER doctors who shared advice on how to avoid common health hazards of the season. Teetering on a ladder to string those twinkle lights up, or even reaching to place a star on top of your tree, are a common cause of injury during the holidays. “We see a lot of falls from ladders and roofs. People who aren’t typically accustomed to climbing on ladders are getting up on them at this time of year. It tends to be wet and ladders are really slick,” said Dr. Ryan Stanton, an emergency medicine physician from Lexington, Kentucky, and spokesperson for the American College of Emergency Physicians. It doesn’t even have to be a tall ladder. Anything above ground level can pose a problem, he said. Falls can lead to an assortment of musculoskeletal injuries — muscles, nerves, tendons, joints and cartilage in your upper and lower limbs, neck and back can take a hit. Stanton said a large portion of the population in middle and older age, many heart patients, take prescription anticoagulants for pre-existing conditions or a baby aspirin a day for heart health; these medicines increase the risk of bleeding after a fall and the risk of complications with cuts, fractures and brain injuries. “The biggest one that scares us though is head injuries, especially in people on blood thinners,” said Stanton. If you’re not used to climbing ladders, call a professional to do the job, Stanton recommends. It may save you a lot on your medical bills. Alcohol-related injuries definitely ratchet up during the holiday season, said Stanton. “It’s an atrial fibrillation from indulging too much and binge drinking. It has to do with stress and the alcohol. They come into the ER with shortness of breath and chest pain feeling like they’re going to pass out,” he explained. Sometimes a patient’s heart can stabilize on its own, but other times, doctors need to “convert” them — correct their heart rhythm by electrically shocking it in order to reset its rhythm. The procedure is done with the patient under anesthesia, otherwise it would be very painful, said Stanton. Drinking can do more than heart damage. It also wreaks havoc on the roads, said Stanton, who sees a lot of alcohol-related car accidents this time of year. Don’t drink and drive, and don’t let someone else drink and drive, say the experts. If you’re drinking, designate a non-drinking driver or take a cab, Uber, or hire a car with a group of friends, or take public transportation. AAA offers free ride programs at some select auto clubs during the holidays. If you’re the driver, be sure you’re well-rested before you hit the road. To keep your youngest passengers safe, the U.S. Centers for Disease Control and Prevention recommends always buckling up children in the car and making sure they are sitting in the appropriate-sized car seat or booster seat. Before traveling long distances, make sure your car is in working order, leave with plenty of time in case of delays, and bring snacks and drinks plus warm clothes and blankets if the weather is nasty and cold, said Stanton. They’ll come in handy if there are back-ups or car trouble hits. If you have to catch a plane or train, leave lots of time to get to the airport or station. Be especially careful in parking lots this holiday season, said Paul Kivela, a Napa Valley emergency medicine physician, medical director of Medic Ambulance in Vallejo, California, and president-elect of the American College of Emergency Physicians. “People are very hurried at the holidays, particularly in parking lots where there are a lot of cars and people are backing up. We see a fair number of issues in parking lots. People get hit by cars. We see broken bones and punctured lungs,” Kivela said. According to the National Safety Council, as many as two-thirds of drivers may be pulling into shopping centers distracted, and one in five accidents happen in parking lots. The biggest distraction for parking lot drivers: mobile phones. Consider shopping online or heading to the mall early in the morning or on less-crowded weekdays. Being around crowds ups your chances of catching the flu and other winter bugs. One important step you can take to protect yourself from nasty germs is to wash your hands often. And don’t forget your kids’ hands, too. Flu season is starting to take hold in the U.S., and health officials say local outbreaks are expected to get worse in the coming weeks. Kivela said he’s already seeing cases of influenza in California. “I saw 5 people on my shift two day ago. Older people, children and people with chronic health issues are especially susceptible,” Kivela noted. The CDC recommends a flu shot for everyone over the age of 6 months to reduce the risk. Overindulging can make anyone feel crummy from indigestion or constipation, but sometimes the results can be more serious. “People tend to have more heart attacks over the holidays season — partly it’s eating and partly it’s stress,” Kivela said. Those with chronic health conditions, such as high blood pressure, diabetes and allergies, are particularly vulnerable, said Stanton. “Once you throw your system off, it can take days and weeks to get balance back again. Once diabetes starts fluctuating, for example, it takes a while to level back off again,” he said. The American Diabetes Association and the American Heart Association offer holiday eating guides to help people plan ahead. The Academy of Nutrition and Dietetics also offers tips for food allergy sufferers this holiday, including hosting at your own home; focusing on whole, unprepared fresh foods; and bringing your own dish to festivities. Stanton also recommends party hosts prepare food carefully, keeping surfaces and hands clean during preparation to reduce the chances of food poisoning.